Posters are a great way to advertise an event or performance. Eye-catching design in a high-traffic area can really drive interest. Special discounts are available for non-profit organizations. 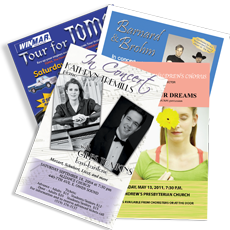 Small format posters are almost any size to a maximum 13 x 19″. They can be printed on a variety of materials: standard paper, coated and card stock. Small quantities, < 500 can be completed within 24 hours.